Welcome to our club, see you on the water! The club is open to all members of the public and is intended to promote kayaking and canoeing in a cross community environment. We are mostly non-competitive and we aim to encourage people to feel safe and confident in a white water or sea environment. Over 1000 paddlers hit the water every year on over 200 trips across the North of Ireland, and occasional trips further afield. 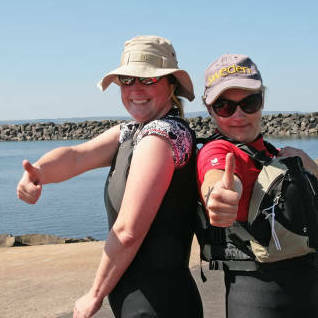 Although mostly a sea-kayaking club, our members enjoy participating in several of the canoeing or kayaking disciplines: open (canadian) canoeing, white water, playboating (freestyle), surf and sea kayaking are all catered for. The Club is a registered charity XR60023 and is affiliated to the Canoe Association of Northern Ireland (BCUNI/477/club/2002). Taking your first steps in kayaking can be daunting. We want to help make it enjoyable! To build confidence and good basic skills, we try to get as many people as possible to obtain British Canoe Union Beginners and Intermediate Certificates (1-3 star personal skills awards). To achieve this we run a number of training courses every year. All our training courses are open to all members at no cost. 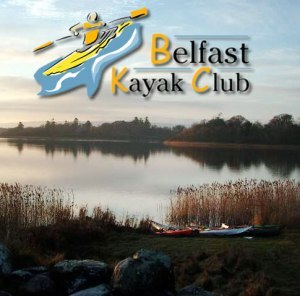 Belfast Kayak Club was founded by John Napier and Mike Totten in early 2000, but was not formally constituted until 2003, when it was recognised as a Charity by the Inland Revenue. However, in many respects the Club is significantly older dating back some 12 years when Paddy Boyle and Brian Maguire began to run canoeing sessions in the Robinson Centre. In recent years the pool sessions have been run by John Cunningham and Malcolm Vincent, with Robert Montgomery, Peter Bell, John Stuart, Patricia Scovell & Greg Miller taking people from the pool to the sea. 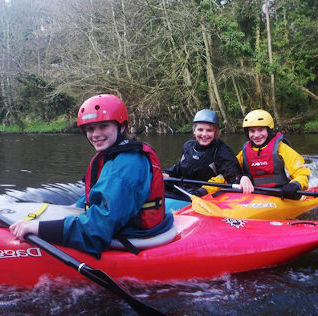 The Club funds and runs introductory canoeing courses for beginners and new members, working towards two and three star awards for club members. We run white water training paddles, and where possible organise white water safety and rescue courses for the more advanced members, and VHF courses to enable club members to get radio qualifications. Every two to three years we run a Rescue & Emergency Care (REC) First Aid course. We organise simple afternoon & evening trips and multi day trips for club members, mostly in Northern Ireland – but we range further afield. We aim for two weekend paddles a month that will include every discipline of the sport. During the summer we continue our Tuesday Evening sea paddles around the North Irish coast. We try to venture further afield when possible. Locations we have paddled include the River Barrow and the Spey River in Scotland, the Isle of Skye and the Isle of Mull. Paddlers have ventured from Belfast across the Irish Sea to the Isle of Man and to Scotland. The furthest trip has been a 14 day sea kayaking expedition to Alaska. Those of us who stayed at home have fun on the Strangford, Blackwater and Bann canoe trails, and on Lough Erne.